The exhibition “Well-known Unknown” brings together seven young artists and artist groups in their 30s who are lesser-known compared to other artists that the gallery represents, such as Yang Hae-gue and leading Dansaekhwa artists such as Ha Chong-hyun. Artists featured at the “Well-known Unknown” exhibition are Kim Na, Kim Hee-cheon, Nam Hwa-yeon, Oh Min, Yi Yun-yi, VERYTHINGS and EH. “I thought it would be interesting to highlight the anonymity of young artists as opposed to the fame and celebrity of other Kukje gallery artists,” Kim added. The artists, who have backgrounds in design, architecture, literature and fine art, present their work through unique ideas and eye-catching displays. There is a wide range of artwork on show, including sculpture, installation, photography and media art. Artist Kim Hee-cheon, who studied architecture, presents a compilation of some 1,600 short videos he uploaded on Instagram from June 2015 to June 2016. The videos symbolize the artist’s state of mind that frequently shifts between his daytime office job at a cultural foundation and work as an independent artist. “I was juggling two responsibilities during that period and I was uploading videos on Instagram, which I realized only later was an act of protecting my other identity as an artist,” he said. The videos he uploaded in order to protect his “artist identity” are edited to look like screen savers that disappear with a single mouse click -- his vulnerable artistic identity easily disrupted by his daytime office job. “Before I come into the office, I promise myself that I won’t act like an artist, but it’s hard to do that. Soon after, I begin to act like an artist. It’s hard to find a balance between my two jobs,” he said. Yi Yun-yi, who studied literature, creates videos and installations that narrate her own memories and stories. She directed and starred in a movie in which the artist behaves like an actor from a silent black-and-white slapstick comedy set on a rooftop of a building in New York that overlooks major attractions in the city, including the Empire State Building. 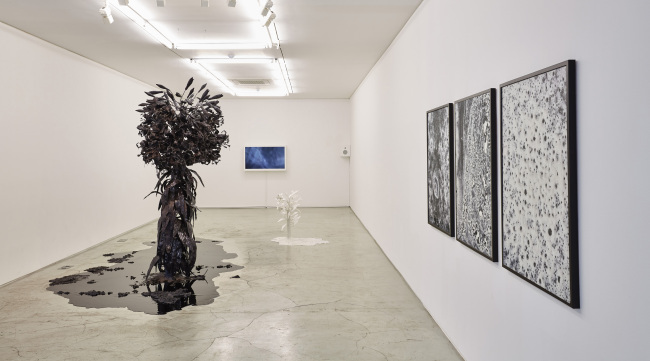 Nam Hwa-yeon, whose work was featured at the Venice Biennale main exhibition in 2015, presents a black plant sculpture inspired by a deformed daisy flower found in the tsunami-hit Fukushima area in Japan. The plant that looks like a tropical tree covered in sticky, black crude oil, is the first plant to be included in the garden Nam envisions to be full of deformed plants. The artist explores the botanical theme of nature and plants in an eight-minute video work “The Botany of Desire,” in which the artist uses two screens -- one to display her research and another which shows dancers dancing to the sounds she collected from a tulip auction market. The exhibition runs until July 31. For more information, visit www.kukje.org.